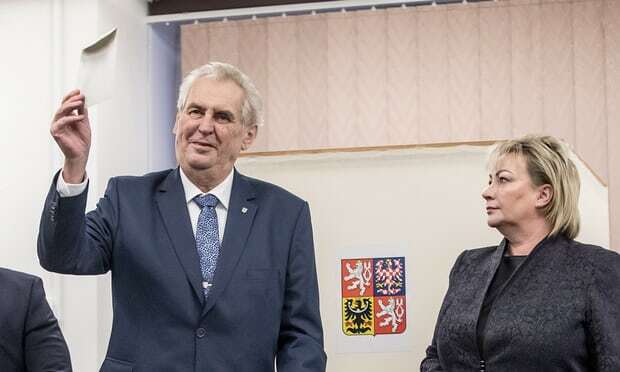 Miloš Zeman leads first round of Czech Republic presidential elections – Royal Times of Nigeria. The Czech president, Miloš Zeman, led the first round of the Czech Republic’s presidential election on Saturday by a wide margin. Eight candidates are seeking to oust Zeman, whose inclination toward far-right groups and cosy relations with Russia and China have split public opinion. With 30.6% of voting districts counted, Zeman led the race with 42.9% of votes, while Jiří Drahoš, a 68-year-old pro-western academic, won 24.7%. Unless the winner takes more than 50% in the first round, the two highest-scoring candidates will go head to head in a run-off planned for 26-27 January. The vote is seen as a referendum on Zeman, 73, who has been in office since 2013. He has criticised migration from Muslim-majority countries as well as Germany’s decision to accept many migrants. Czech presidents have limited executive powers but Zeman and his predecessors have had a strong influence on public debate. They are also pivotal in forming governments – which the European Union and Nato member country is now trying to do. Zeman’s lead does not mean an easy win in the second round. Many voters may switch from their losing candidates to support the runner-up against Zeman.